Samuel sought a future king from the sons of Jesse, he rejected each one who was presented to him, beginning with the eldest. (1 Sam 16:6-13) It was simply taken for granted that David, who was the youngest, would never be chosen king, so his father did not even invite him to join the group. He is nearly forgotten until Samuel asks Jesse if these were all the sons he had. Jesse’s response went something like, “Oh yes, there is one more, but you wouldn’t need to waste your time seeking him. He is the baby of the family.” David then, at Samuel’s invitation, was called in from the fields where he was herding the sheep and was anointed by Samuel as the new king of Israel. We might think in various circumstances that we are not qualified for some particular office or job. We are too young (or old), unskilled, unworthy, or uninvited. Yet we know our qualities and abilities and need to believe in ourselves. We may be the very person the Lord is choosing for some particular role in life. Those who attend early morning Holy Mass should find great consolation in Mark’s Gospel (1:36): “Rising early the next morning, Jesus went off to a lonely place in the desert; there he was absorbed in Prayer.” Jesus could have slept late and prayed at home, but he did not. He chose to leave the house to find a quiet and meditative place for prayer. I love the word used to describe his prayerful frame of mind. He was “absorbed” in prayer. We think of sponge absorbing water until it is saturated. Jesus, in prayer, was saturated with the thoughts, the sentiments and the glory of God. Then, filled with grace and power, he had more than enough to pour out on all he met that day. We come to church and strive to enter into that same kind of quality conversation with God. By being open to whatever God wills for us each day we place ourselves in a position where we are able to absorb the strength we will need. We often think of prayer in terms of asking, but prayer also entails praise and thanksgiving. When we pray well we become absorbed in the presence of God and worship in spirit and truth. We need to participate fully in the holy sacrifice of the Mass and not limit our prayer to a quick preparation for communion. We become absorbed in God’s Eucharistic presence by concentrating on all the readings, prayers and ceremonies, Jesus strongly believed in the power of prayer and gave to it quality time each day. On a day-to-day basis it is easy to 'do' things (surface activities) or 'have' things (possessions) to mask the unhappiness that prevails deep down. But this relief is only temporary; real happiness (often referred to as Joy) does not come from the outside, it comes from deep within. It is always there and available to us, but our minds have contrived to cover it up with the conditioning and emotional junk we have collected throughout our lives. Now we simply need to clear this out and 'free' the joy. It is not a case of adding anything, there is no need, and you already have everything. You are already complete! Just clear a path to this Real You and connect with your Joy. Clearing a Path to the Real You is like walking through dense jungle. This may be a struggle in the first time as there is no path to follow and every step is a new challenge. The story of David and Goliath is one of the most familiar in the entire Old Testament. David was no match for Goliath, and his slingshot did not assist him nearly as much as being armed with personal confidence and God’s grace. David was sent out with the blessing: “The Lord will be with you.” (1 Samuel 17:45). That same blessing accompanies us when we leave at the end of Mass. We also go forth to face our giants and heavy problems which are often too large for us to overcome unaided and alone. We often wonder if we can survive, let alone conquer. David’s victory encourages us to fight bravely and overcome those obstacles which stand in the way of life which we feel are noble and good. These giants stand against us in the forms of persons, attitudes, things. Like David, we too are called to fight against it, with the blessings of God. In the extremely competitive world of exams, a student finds it difficult to survive if they are not equipped with a thorough knowledge and the art of competence. Knowledge is the ladder which leads to success. A proper education must enable a child not only to gain knowledge but also imbibe the confidence to work independently and to taste the fruits of success. In the eye of many a student, success lies in somehow passing an exam or attaining high marks. It is in this mode of thinking that the entire flaw lays. Thus students turn to unhealthy and drastic methods of practice such as copying in the exams or choosing cross –cut methods with only the examination point of view. The importance of adding to the treasure-chest of knowledge is often lost on them, as the subject is not understood nor learned for helping them with their professional career life. Today’s students lack the necessity to think for themselves and to be independent. They rely on extra help as an alternative without persevering or applying themselves patiently on the relevant database given. Is there a need for this waste of time and energy when we are already given necessary coaching according to the prescribed syllabus at school??? Tuitions are beneficial, you might say, because there are a lot of seemingly extra hours of learning involved and extra notes gathered. But we cannot ignore/forget our true Guru’s -our Class teachers who have updated our knowledge. Students should learn to sit down at the library and collect extra references if they feel they need a little more than the class notes. Any doubts that may arise eventually can be noted and clarified later with the respective teacher. However, weak students and students planning to attempt entrance and other exams of a different pattern or syllabus may consider extra coaching but it should not be taken as an excuse for eroding the teaching of the regular curriculum. There could be hours added in the timetable for counselling/clarification in such matters so as to enable the student to approach the subject with confidence, understanding and enjoying every chapter of its creation or discovery or application. It is sincere hard work that makes up an ideal student. As Einstein once said ‘Genius is 99% perspiration and 1% inspiration.’ A true education should equip a student with the profound sense of propriety and proportion to enable him to face the challenges of life, and provide him with the resource to shoulder the responsibility of building up a better and stronger nation, a brave new world. Now a student has access to enough subject material only if they can sit down to seek-thanks to the present media. In our present World this confidence will stand a long way to help one to stand on his own reason, seeking the required help logically making them approach life in a more Spiritual manner. Rt. Rev Dr. Soosi Pakiam, the archbishop of Trivandrum, Kerala lost his mother in the year 2007. Funeral mass was celebrated at cathedral of Neyyattinkara Diocese, Kerala. During that mass the archbishop thanked everyone and said that he did not know how and when he would be able to complete expressing the gratitude to all who took part and shared his sorrow and prayed. If one analyses onself sincerely, will come to realization of many facts which will prompt to become more spiritual. Our life itself is a gift from many sources, especially from God and our parents. One who realizes the blessings of God and becomes grateful to Him, becomes a saint. In the same way if one comes to the awareness of the blessings through parents, he will become great before God. This can be the starting point to holiness itself. The book of Sirach 3:1-16 speaks of children’s duty to parents. This passage tells how children can express gratitude to their parents and be true children of God. The children must become aware of their obligations than the rights. That is the beginning of spiritual life. The people who had been grateful and humble had become great. If one does not become grateful, that means the person is not accepting that whatever one has are blessings but rights. In this life, nothing is ours not even our life -gift/blessing from –God, Parents, others even nature. The church was established in the year 1864 by the British, for the Employees of Railways in Rewari, Haryana. 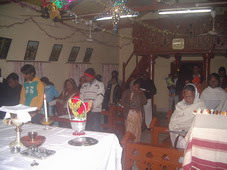 The church is in the premises of the Railway Colony.The pastoral Visit to this Parish was on 13 January 2008. The Parishioners, Br. Lawrence K George OFMCap, parish priest and F M M sisters of Deepti Ashram, Rewari received Rt. Rev. Dr. Vincent Concessao, Archbishop of Delhi. Mr. Sushil Prabhath Shah, Parish Pastoral Council Secretary, welcomed him and Mr. A. David, Vice-President of the Parish Pastoral Council garlanded him marking cordial welcome to their Shepherd. Solemn Holy Mass was celebrated in which. Br. Joseph Joyson OFMCap, Guardian of Navjyoti Capuchin Ashram, Bawal and Br. Lawrence K George OFMCap, parish priest of Rewari concelebrated with the Archbishop. The Shepherd addressed his sheepfold. His visit rejuvenated the spirits of the parishioners. The grateful faithful expressed their joy and contentment at their fresh achievements with the arrival of the present Parish Priest. The parish priest thanked and congratulated all members of the parish for taking the lead in all parish activities.This Parish is taken care of by the Capuchins of the Prem Jyoti Custody, Delhi, since 2005. Br. Reynolds was the first Capuchin priest who served this parish. Br. Lawrence Capuchin has been serving as Parish Priest here since 17 December 2007. It is a story from Liberia, West Africa. 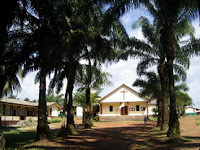 One day a boy came crying to the Missionary Parish Priest’s presbytery early in the morning. He said sobbing that he slept in the forest previous night. He ran away from his house for fear of punishment. Previous day evening his father asked one of the soldiers who passed by, to beat his two children 50 lashes each (punishment to children in rural Liberia consists of at least 25 lashes even today.). The priest took the boy to the parents and found what the boy told was true. The father wanted to punish the children for their mistakes. Since his beatings were not very “strong” he asked a soldier who was passing that way, to help him execute the punishment. With the advice of the priest, the parent then on changed the method of punishment to his children. Every child is a child of God, who creates them in His image and likeness. God chooses the parents for a child to be born so as to bring him/her up according to His will. Like Jesus, the Son of God was brought up by Joseph and Mary, every child is to be brought up by his/hr parents. 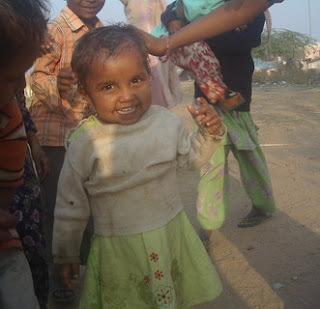 A child is born with a special mission so that God’s plan for humanity may be fulfilled. The parents have the right to punish the children only if they truly love the child. If one does not love his child, he has no right to punish him/her. There are many types of workers, but the guidelines apply to all. One should not look around to see what others are doing, in order to determine what one should do. When you do your job well feel a satisfying sense of accomplishment but you should not expect a gold medal or a written note of congratulations for doing only what you were expected to do. Remember the Lord is our Divine Master and we are his servants. Our duties to Church and religion are not based on how much others do, but on what the Lord tells us that we should do. Solid basis for one’s spiritual life. Spiritual life must be built on deep faith—symbolized by the image of the rock. In fact, Jesus says that the manner in which we build will determine if we are foolish or wise (Mt 7: 27). Isaiah, too explicitly proclaims that “the Lord is the eternal rock.” [Is 26:1-6]. All must be based on this eternal rock. Even the lofty city will fall if it becomes too far removed from its foundation. The Tower of Babel owed its origin to the population of the city where the people plotted with each other to rival God. The tower was a work of extreme pride. If we stay humble and close to the ground, then we won’t fall. No structure is any stronger than its foundation. “Eternal rock theology” assures us that our structure of faith may be shaken but will not collapse and fall if built on the life and teachings of Jesus. The American Management Association had made a study on the reasons why certain managers fail. Some stated causes were: (1) They did not know how to or did not want to delegate their authority. (2) They could not organize people under their jurisdiction. (3) They did not know how to organize their own time. These and other factors led to their downfall. But there was one other major cause of failure which was more basic and more serious than all the rest. Their biggest fault was their arrogance. Arrogance is defined as a feeling of superiority manifested in an overbearing or haughty way of relating to others. Jesus was a person of tremendous authority, both over people and over spirits, as is clearly manifested in the gospel of Mark 1:21-28. Yet, the Lord was always meek and humble of heart (Mathew 11:28) - the exact gentleness and humility and allows our authority to be exercised as much from the heart as with our head, and then we can hope to be successful leaders and managers, too. We would also be wonderful Christians, living in the true spirit of our divine master. God is our father full of love. His love is overflowing - love which was shown to humanity through his Son, Jesus Christ. The Holy Spirit is strengthening or preparing us to be able to receive His love. The motivation for prayer should be honour God’s name, not just for selfish reasons। We do not pray for our own glory but to His glory. God wants to meet our material needs: He knows that we need to eat & drink. “Daily”: we need to pray daily. Someone says that Jesus’ psychology is the psychology of forgiveness. When we forgive others and experience God’s forgiveness, we are emotionally set free. Sin destroys our relationship with God. We need to pray that God will deliver us from temptations and from the devil who seeks to destroy us. In its simplest definition prayer is a conversation between the one who is praying and the one to whom those prayers are directed. To have an effective prayer, the following four steps can be helpful. (iv) SILENCE: Silence is important; in that it allows us time to digest all that has been said through prayer. It gives us precious time within worship to let our hearts talk. We have to listen to God. God speaks to us. Only one who listens to Him can have good relationship with God. An important point for many is to sacrifice their careers for a successful Catholic Family Life. After all we have this one life to have a family for life. In the speed of our present urban life styles we often forget our responsibility for becoming sensible to our faith and practice. Children require the best attention in the house where one parent can always contribute with great sacrifice their needs of the questioning minds. The housewife becomes a homemaker, a home engineer, architect, mentor, guide and all, this being the greatest of all doctorates. Two minds in one body should be the theme as desired by our Sacrament. This sacrifice of sharing by the husband to the wife and vice versa would bring the children to see the promises of a good Marriage. Careers, Ambitions, Opportunities, Wealth generation can be put to the back stage for a quality married/family life. Spending more hours to keep the family in unity, in prayer, in laughter, in plays, in decision making, must be in the highest priority specially on the Sabbath day. Increasing time for my family can be done easily but we need to avoid the likes of TV, unnecessary phone calls and interruptions - switch that mobile phone when not required, Internet timings - when children are given undue liberty by parents only to be linked to other people with unknown ideology, help with housekeeping which is a good ritual to improve responsibility and care. Most important as I always have learnt is the treatment of money. Man made them but we must not fall victims to it after all it will never bring us happiness. Even if the husband and wife are working, the money has only one title - OURS. Many working family have the husband saying ‘it is His money’ or ‘it is Her money’ which becomes a sort of a mental barrier. The family should discuss, specially when children are grown up about their financial commitments, their investments, their affordable purchases, future planning, insurances and savings. I am sure anyone can live very happily provided he cuts his budget to the size of his purse with all the restrictive sacrifices. Let us pray for having better families so that better mates may be found to improve our society and to alleviate decadence. -Donald D'Cruz ddonalddcruz@hotmail.com Bethan Ville, Mundakkal West, Kollam-691001. 9846012411, 0474-2748422. Animals are also important. 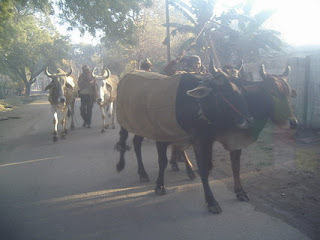 Not only important but also are most modern with new style in North India. How are they in their winter clothing? London: If you think that only young people are hep, you are wrong. If a study is to be believed, the older you get, the smarter you become. A team of researchers in Europe has carried out the study and found that brain power actually increases with age. · Look for possibilities and solutions, not for threats and dangers. · Consciously chose how you interpret events, and come up with constructive ways of looking at situations. · Keep your sense of humour and see things in perspective. · Make a choice and take responsibility for it, believing that what happens to you is the result of the choices you make. · Focus on your strength and realize that it is not necessary to compare yourself to others. · Show your love and value one another. · Allow for individual differences. · Look for opportunities to be encouraging. · Keep your sense of humour. · Recognize that it is okay to make mistakes. · Find ways to support one another. · Do not criticize, condemn or complain. · Give honest and sincere appreciation. · Arose in the other person an eager want. · Become genuinely interested in other people. · Remember that a person’s name is to that person the sweetest and most important sound in any language. · Be a good listener; encourage others to talk about themselves. · Talk in terms of other person’s interest. · Make the other person feel important and do it sincerely. 1. Thou shalt practise deep breathing and sit silently for short time everyday. 2. Thou shalt organise thy time and prioritise the jobs. 3. Thou shalt control thy environment by avoiding gossip-mangers and the garbage they speak. 4. Thou shalt give thyself positive feedback. 5. Thou shalt take regular breaks in work and study. 6. Thou shalt exercise daily. 7. Thou shalt not poison thyself with Junk food. 8. Thou shalt say ‘no’ when overburdened. 9. Thou shalt relax and rest well. 10. Thou shalt enjoy thyself and be happy. Catholic Church, Rewari, Haryana was established in the year 1864. This Parish belongs to the Archdiocese of Delhi. 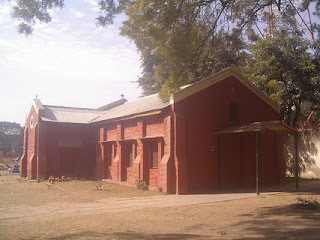 It is in the Railway Colony, Rewari and was built for the employees of Railway of that time. Now it is looked after by the Capuchins of members of Delhi Region. Fr. Lawrence K. George ofm, cap. is the present parish priest. 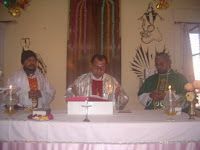 The Pastoral Visit of the parish is on 13th January 2008. It is our intention to share life transforming concepts to help as many people as possible to discover how to direct their thoughts to bring forth lives that are filled with prosperity, joy and health. In our own search for these answers we have found the teaching of many great thinkers who have actually demonstrated what they teach in their own lives. This is the imperial proof we require from anyone who professes to know the laws of the universe. One of the most masterful teachers of New Thought was US Andersen. We cannot praise his teachings enough and highly recommend them since they resonate completely what with the Laws of Attraction. "A man changes the state of his outer world by first changing the state of his inner world. Everything that comes from outside is the result of his own consciousness. When he changes that consciousness he alters his perception and thus the world he sees. This change comes primarily as one changes his inner visualization to align with what he feels and what he truly desires to see in his world." This concept is termed Inner Vision by Andersen. Inner Vision is synonymous with imagination. Imagination flourishes when we plant our desires in our subconscious mind, add passion to that desire and watch as it manifests in our world. Our attention on our inner vision, fueled with feelings that empower it, is certain to bring forth the fruits that were planted there. It is also very important to be clear in what you imagine - your vision. Then go on to empower it with your passion - your emotion, and the outcome is certain to be as you intended. 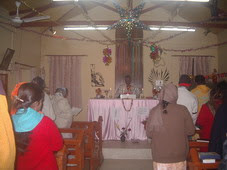 Christmas was Celebrated in the Catholic Church, Rewari. All the members came for the celebration. Message:Christmas is the celebration of God becoming man or taking human form. This means God is expressing his humanness in a way man can understand it. This same thought, St. John the evangelist puts in his words, WORD BECAME FLESH. This expression is based on Greek philosophy. The Greeks always reflected and spoke of LOGOS (Gk), means “word” which is a link between God and man who will bring order and arrangements in the world. God cannot be seen or experienced through our senses because God is God. In addition, we experience and understand God’s qualities (godliness) through different human beings and even other creatures like plants, birds, etc. We see people who are holy, generous, gentle, loving, caring, motherly and so on. These are different qualities of God. And we are very happy with these people. We call them great people [MAHATMA], Saints etc. Why? Because we find God in them. In other words they are the different expressions of God. Let us have a look at them and find how they grew to this stature of their life. To understand this we need to go their beginning itself. If we analyze we will find a lot of preparation even before their birth. The birth of a child is very important because it is god who will be born through a child. And the birth of a child we see as well planned one (Isaiah). Christmas tells us how God becomes man. And what should be the preparation for a child to be born. God is inviting us to give birth to physical as well as spiritual children. Let us respond to God like the Joseph and Mary in the Bible. Dr. Meyer Friedman said that lifestyle and creative use of leisure can be more important than diet and exercise in preventing heart attacks. Many people who have paid attention to the body and diet and have neglected the spirit and are dying inside. 1. Stop thinking about several things at one time. 3. Read books that demand concentration (games, too). 5. Plan for some personal quiet time each day. 6. Finally, things worth being are better than things worth having. Remember the people who were here first. The Native Americans had an ability to live by the ages rather than by the day. Among certain tribes in North America were those who would make decisions for the tribe based on how that decision would affect people seven generations into the future!